A few days ago, I had a long conversation with an old friend, who I’ll call “Randall.” Randall is in a deep financial, personal, and professional crisis. Instead of tackling the challenge head-on, Randall seems to be in something of a holding pattern. He’s just drawing his unemployment, putting off some personal responsibilities, and spending a lot of his time goofing off on the internet. Personal faith in God can be a powerful thing. I’ve witnessed how such a faith has helped guide people to some incredible positive changes in their lives. I’ve seen how a community of people guided by their faith can keep a food pantry running. I’ve seen people of faith making sure that children have a wonderful meal and a nice gift at Christmastime, and I’ve witnessed countless other positive results from personal faith. One key factor that unites all of these good things, however, is taking action. The tools may have been provided by a higher power, but without a person standing up and saying, “I’m going to keep this food pantry open” or “I’m going to make sure that Johnny and Jenny have a nice Christmas this year,” none of these things would have happened. Were they called by a higher power to do these things? Was it their own conscience? In the end, it doesn’t really matter. We can’t know what caused them to do it, but what we can see is that they did these things. Because of someone’s actions, the food pantry is open and Johnny has presents under the Christmas tree this year. This translates directly into one’s own life. At any given point in your life, you can choose to wait for opportunity to come along or you can make opportunity come to you. You can sit back, draw an unemployment check, and wait for a great job to fall on your lap. On the other hand, you could spend your time trying to build a side business, training yourself for a new job, or actively pounding the pavement for new work. If you’re struggling with debt, you can just keep spending like you always are and believe that money will fall into your lap, or you can make the active decision to cut your spending, get things into better shape, and lead a life with opportunities that are free of the pressure of debt. If you’re waiting for God to provide the tools you need to change something in your life, you should know that those tools have likely already been provided to you. You have free will. You have the power to choose how to spend your time and energy. You have a community around you that’s willing to help you. You have a creative and thoughtful mind, one that’s capable of processing information and translating it to your own life (if that weren’t true, you wouldn’t be reading this). God has blessed me with a lot of gifts in my life. I’m incredibly lucky to have what I have. In fact, I’m incredibly lucky to be able to get up in the morning and breathe a breath of fresh air. I don’t expect God to also drop a pile of cash or an undeserved contract for some great opportunity right onto my lap. It’s up to me to take all of the gifts that I have and get to work if I want something better for my life or for the world around me. By “gifts,” I don’t mean money. I don’t mean the right to a steady income. I mean things like relationships with people who care about me, the ability to write quickly, the ability to absorb ideas relatively quickly, and the opportunity to live in a place where it’s possible to build a strong future for yourself and your family. Those are gifts, too, and they’re powerful ones. On our currency, I see the phrase, “In God We Trust.” I suppose one can take that to mean a lot of things. My take on it has been that it doesn’t say “In the government we trust” or “In America we trust.” Instead, it speaks to something more personal and individual. If we want to live the American dream of financial independence, we shouldn’t expect that others will simply hand it to us. Instead, we should look around us for the gifts we’ve been provided – whether those gifts are equal to the gifts of others or not – and the opportunities that others have provided for all to use, then focus on using those gifts to achieve what we want from life and what we choose to share with others. Money itself is nothing more than a way to exchange those gifts. 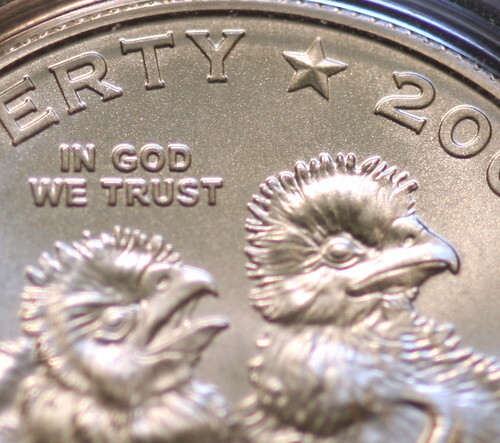 Keep that in mind the next time you read the phrase “In God we trust” on your currency.